All drum kits are not created equal. We’re here to help you find one that will best fit your level of experience and your budget! We have put together this list of the top ten drum kits to help you make an informed decision, and we’ve done all the applied research to make sure that these drum kits are legitimately the best. Before we get started, here are some things that you should keep in mind while shopping. 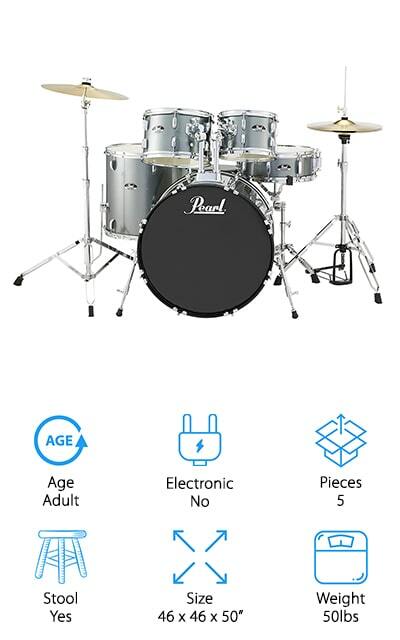 Age: What age is the drum sets for? Adult drum sets might be universally used, but some drum sets on this list are specifically for younger children or teenagers. We’ll let you know here. Electronic: Electronic drums have different features, including control panels, recording stations, and all of the other fancy bells and whistles. If that’s what you are looking for in a drum kit, find that information here. Pieces: How many pieces does it come with? We’ve counted each drum and cymbal set as a separate piece, as well as any pedals or stools that may come with the set so that you know what you’re getting. Stool: If the set comes with a stool, we’ll let you know here. If it requires on, they most likely come with a stool. Certain sets don’t, however, and you may have to purchase them separately. Size: The dimensions of the drum set can help you figure out where you are going to put it in your home. Drum sets are notoriously large, so make sure that you know what you’re getting into. Weight: The weight of the product can factor into your decision, especially if you need to move them from your home to different sets or garages fairly often. Keep an eye on this if you want to go more portable. Let’s start by taking a look at some of the top drum kits on the market right now. We’ve reviewed a ton of products in order to bring you only the best! Our top pick and budget pick are the best of the best, so check them out first before moving on to the rest of the list. Make sure that you make it to the end because there are a ton of great drums here. Rock on! Roland makes top-rated electronic drum set that comes with a sound engine to help your drumming experience. It comes with backing songs so that you can play along and gain experience before trying out with a band. Plus, it includes music from a variety of different genres so you can practice with your style and performance. You can record your performance if you like what you’re doing, and you can use the COACH function to help reinforce what you’re doing right. It can also help you change what you’re doing wrong to build the skills that you need! It’s easy to operate, and the drum set itself is fairly small and easy to record on. The pads that you drum on feels like the surface of the real thing, which is great for new drummers and experienced ones alike! Though it doesn’t come with the pictured kick pedal, it has plenty of components and features for your favorite drummer! The best affordable drum kit is this one by Mendini. 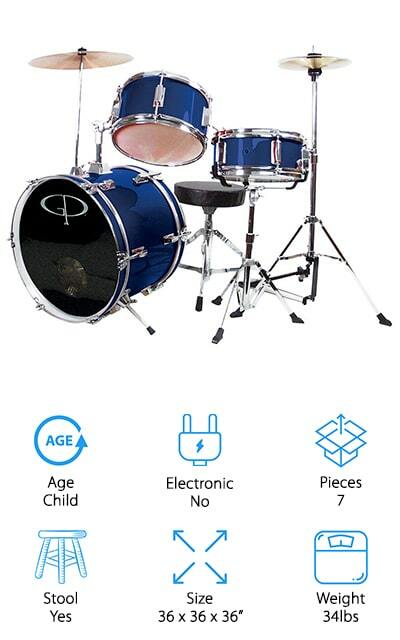 It’s a children’s drum set that’s just large enough for children between 3 and 8 years of age. It includes a bass drum, a mounting tom drum, a snare, and a cymbal with the cymbal arm. It also includes a stool that you can adjust to your child’s height and wooden drumsticks that are, of course, essential. This kit comes in a beautifully accented color, and you can get it in blue, purple, green, black, and red – choose the color that your child likes best and they are sure to be delighted. This is a pretty basic drum set, and we appreciate that it comes with a stool. At 21 pounds, it wouldn’t be unheard of for your kid to take it with them to a jam session with their friends. It’s easy to assemble and sits together fairly well. Plus, it will foster your child’s love of music! 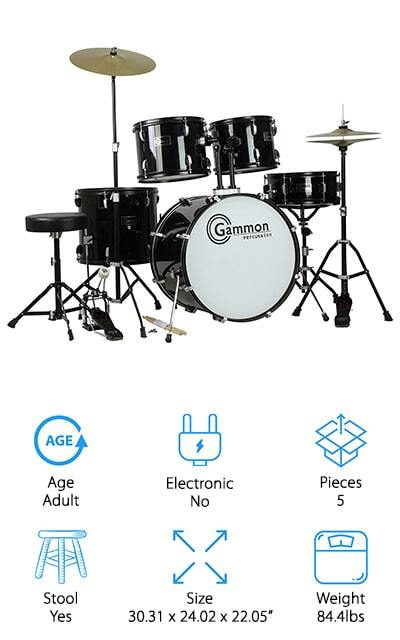 Gammon makes one of the best professional drum kits on our list with their Percussion set. It comes with everything that you need to start playing immediately. You won’t have to purchase anything separately to start once you get this assembled. It comes with a tool, a bass pedal, two types of symbols and full-sized drums. They are made of wood, making this one of the best maple drum kits that we could find as well. There’s a high-gloss black finish over the drums, making them look and feel attractive while you’re playing them. It comes with a drum key and a list of amazing drums and cymbals. They even include an instructional DVD so you can get started on your professional drumming path. Whether you’re just getting starting or you’re a seasoned professional looking for a good cheap drum kit, this is the one that you should consider. You get so much for such a great price! This set by Alesis is one of the best-rated electronic drum kits we found during our research. It’s got 8 dynamic pads that feel like the real thing. They can produce a lot of different percussion sounds, though, including 40 different kit options and 60 playback tracks to play with. The rubber drum pads are durable and include three single-zone toms and a dual-zone snare. Plus, they include a kick pad tower with a bass drum pedal and a 4-post aluminum rack to put all of them on. You can activate the sequencer module, or set a metronome to keep rhythm while you play. Plus, you can record! The auxiliary input will even allow you to play along with a track from a CD or MP3 track. 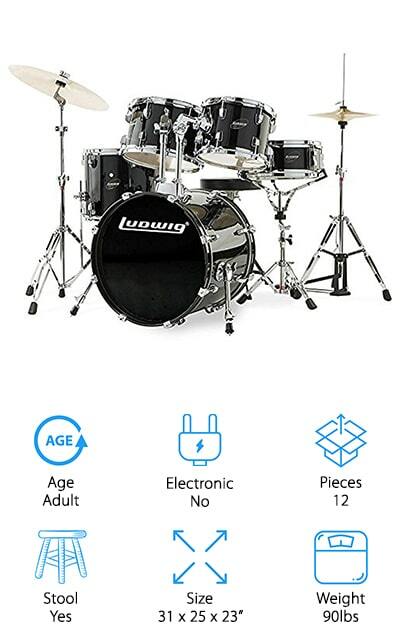 This drum set is full of amazing features that any drummer would love to play around with! You’re going to love all of the modules that are included with this kit, and they’ll really boost your tracks. Pearl Roadshow makes this beautiful drum set that comes with a total of five different drums and cymbals. It comes with a bass drum, two different-sized tom, a floor tom, and a snare drum. There are two different types of cymbals included with stands, as well as a bass drum pedal and a stool so that you can sit comfortably with your set to play around. This is a large adult-sized drum set that is still relatively lightweight so that you can take it with you on a jam session or on the road. It’s large enough to take up some space, so you might have to disassemble it to get it where you need to go. 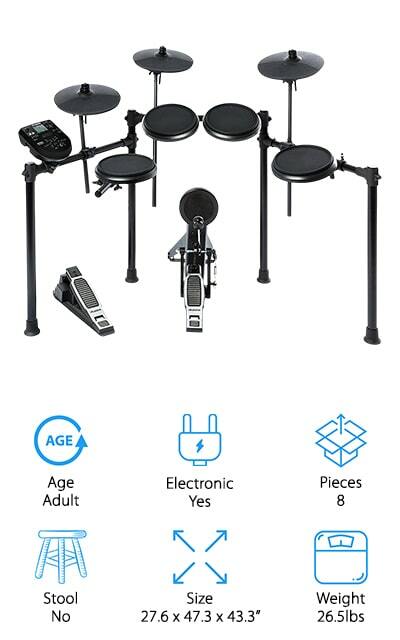 While it does require some assembly, it doesn’t take much to get this drum set up and running once you put it together because it has everything that you need and there are no electronic components. It’s a great set! This electronic drum kit is extremely portable! It’s an entire electronic drum kit in a single piece of real estate that you can take with you anywhere. Use the AC adaptor for power or plug in some C-sized batteries to rock out without a power source. It looks like a real kit and sounds and plays like one too. You can play to pre-recorded kits or from songs of your own. This drums table connects right into your computer, and you can even use it as a MIDI controller for your software. You can record straight to your computer to provide some sick beats for your tracks. If you don’t want to wake the neighbors, you can plug in headphones so that you’re the only one hearing the percussion sounds. That’s a great revolution in drumming for people who live in close quarters or apartments. 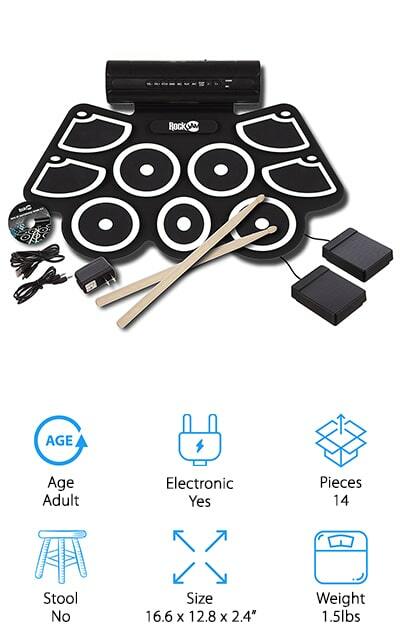 It’s one of the best value electronic drum kits we found! RockJam’s MIDI drum kit is one of the best sounding drum kits on our list. It’s an electric drum kit, but out of all of the electric drum kits we looked at it sounds closest to the original thing. There are 9 drum pads, and you can program each of them to be either cymbals or different types of drums. You can upload your beats right into your PC with the USB cable, or record directly into your favorite music program as well. It’s a thick pad, but you can easily roll it up to travel with it. It won’t take up much room and you’ll be able to drum on the go! It includes two pedals for added effects, as well as the power supply and drumsticks. The built-in speakers will allow you to hear your great beats! 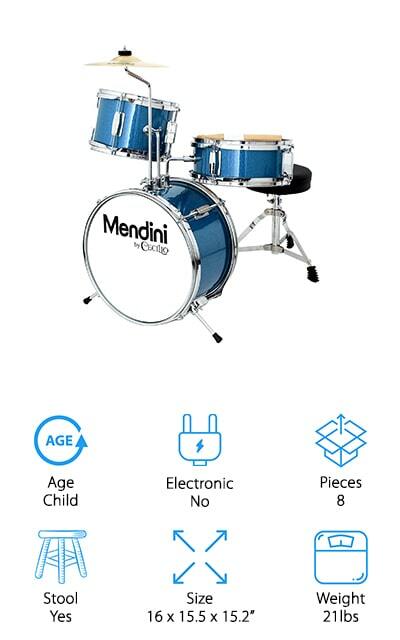 We love all of the different options that come with this drum set. You can do anything with it! This cheap drum kit is still one of the best for children that we could find! It comes with seven different pieces, including a 10-inch cymbal and hat, a bass drum pedal, and a stool. 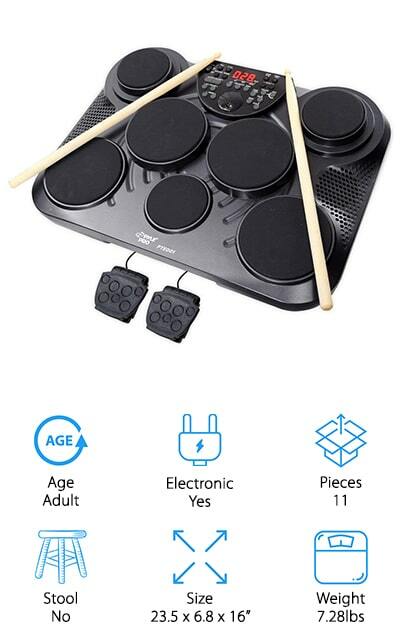 It comes with five different drum tops that you can play to your heart’s content while you sit on the perfectly-sized stool that comes with it. This set has everything that your little one needs to start playing, including drumsticks and a drum key. It is an attractive blue color and there are a lot of other colors available as well, so you can go with the one that your child will like best. It’s a great outlet and a wonderful introduction to the world of music. Though this has no electronic components, it does have the simple, tried-and-true sound of a great drum kit going for it. We know that your child is going to absolutely love it. Every great drummer started somewhere, and that’s where this drum set comes in. 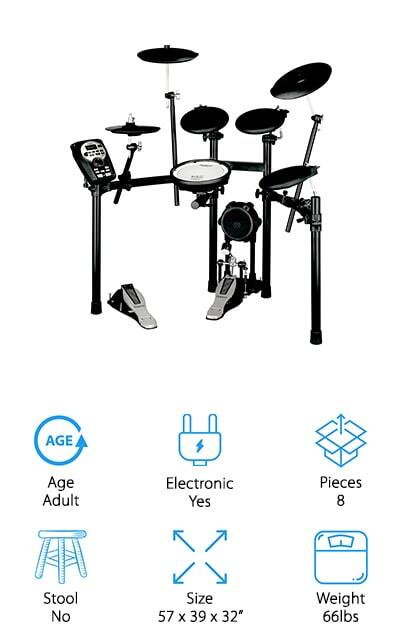 It’s suited for children between the ages of four and seven and comes with a bass pedal, different drum types for different sounds, and two hanging cymbals that shouldn’t be tightened. 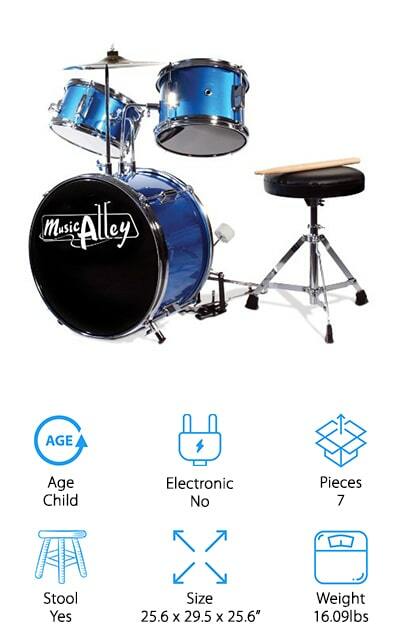 It also comes with a stool so you can sit to play your drums and a pair of drumsticks that are lightweight enough for children to use. This drum kit is for smaller children, but it can definitely start to foster a love for the instrument. And who knows, they might become part of the next huge band to sweep the world! It comes in the beautiful blue color and it also comes in black, so you can choose the one that your child will appreciate the most. Everything that you need to get started right after assembly is right in the box, so you won’t have to run out and buy anything additional. This adult drum set is absolutely massive and comes with a wide variety of drum surfaces, cymbals, and other gear to give you everything that you need to start playing right away. It comes with a bass drum, a snare, floor top, and two different-sized mounted tom. It comes with the stool that you’ll need to sit and play, as well as a variety of cymbals and a rack to put them on. If someone in your life wants to start learning how to drum, choose one of the best cheap drum kits that comes with absolutely everything they could need to get started. They might upgrade their kit later, but they will always remember how much they adored their first complete package. And that isn’t to say that this set is anything less than a high-quality masterwork instrument, because it is made very well and everything is extremely high-quality. It’s a value and it’s well worth the money.